Maglev stands for superconducting MAGnetically LEVitated vehicle. It is a super high-speed transport system with a non-adhesive drive system that is independent of wheel-and-rail frictional forces has been a long-standing dream of railway engineers. Maglev, a combination of superconducting magnets and linear motor technology, realizes super high-speed running, safety, reliability, low environmental impact and minimum maintenance. This is the model ML100. This ML100 is propelled by LIM (Linear Induction Motor). Built as a show-case experimental vehicle, it was intended for celebrating Japan's railway centennial in 1972. It runs astride the inverted-T guideway looking like a vertical wall. As you can see on the specifications this one does not go very fast. "ML" stands for "Magnetic Levitation" and "100" implies the 100th anniversary of Japan's railway. Research and development of Maglev, which adopts superconducting technology, has been underway at RTRI of JNR since 1970. After fundamental tests in the laboratory to verify the feasibility of high-speed running at 500 km/h, the construction work of a 7-km test track began in Miyazaki Prefecture in 1975. The manned two-car vehicle MLU001 registered a speed of 400.8 km/h in 1987. And the latest vehicle MLU002N, which debuted in 1993, was running on the Miyazaki Maglev Test Track. One main development aim of RTRI is the enhancement of reliability and durability of the superconducting magnet (SCM). The SCM suffers from external magnetic disturbances caused by ground coils and from mechanical vibrations generated by vehicle dynamics; these disturbances cause quenching troubles, or the sudden disappearance of magnetomotive force of the SCM. We have studied these problems through many tests and studies, and have developed countermeasures. Other development aims are as follows: aerodynamic brakes, which use the aerodynamic drag of panels on the car roof, and disc brakes for high-speed running; ground coils which consist of sidewall levitation coils; a high-power supply system for pulse width modulation (PWM) inverters using gate turn-off (GTO) thyristors; turnout for high- or low-speed passing. A landmark for Maglev occurred in 1990 when it gained the status of a nationally-funded project. The Minister of Transport authorized construction of the Yamanashi Maglev Test Line, targeting the final confirmation of Maglev for practical use. 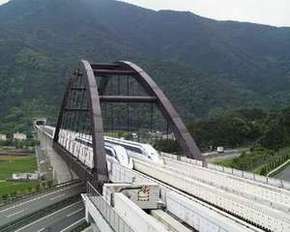 The new test line called the Yamanashi Maglev Test Line opened on April 3, 1997 and is now being used to perform running tests in Yamanashi Prefecture. In the same year, the Maglev vehicle MLX01 in a three-car train set achieved world speed records, attaining a maximum speed of 531 km/h in a manned vehicle run on December 12, and a maximum speed of 550 km/h in an unmanned vehicle run on December 24. On March 18, 1999, MLX01 in a five-car train set attained a maximum speed of 548 km/h. On April 14, 1999, this five-car train set surpassed the speed record of the three-car train set, attaining a maximum speed of 552 km/h in a manned vehicle run.